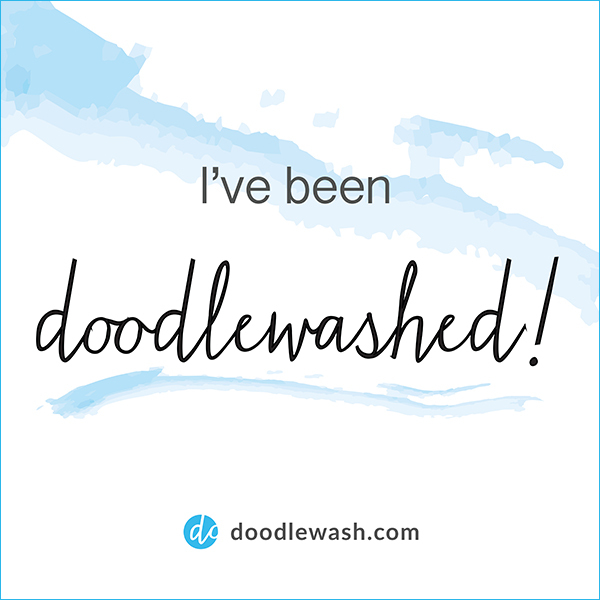 My Italy watercolour journal came home from the trip with blank pages, and has been calling to me from its position on the kitchen counter – “fill me, fill me”! So, I decided to chose some photos and draw some of the wonderful people I met on the trip. 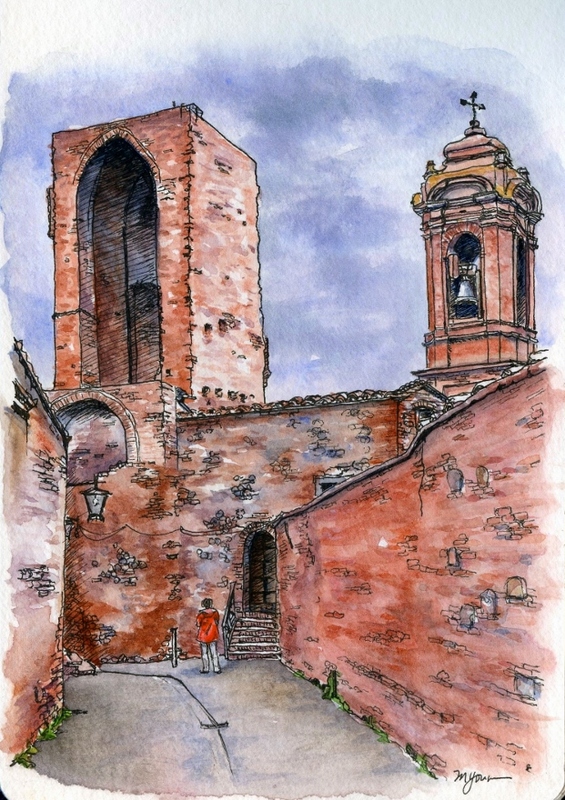 The first pen and watercolour is of Priscilla and her signature orange jacket, taking in the terra cotta and river rock in Citta della Pieve, Umbria. Priscilla is an abstract artist whose works are inspired first by her emotions of a subject and then her curiosity about it. I think that’s why our art group would often lose her on our town visits, as she would wander on her own journeys of discovery (she always found us though!). That’s why I love this photo memory and wanted to capture it in a drawing: She’s off down a long street away from us, likely doing quick sketches as the inspiration hits. In this second drawing, I want to introduce May, a new artist whose exuberance and warmth comes through in her watercolour works. 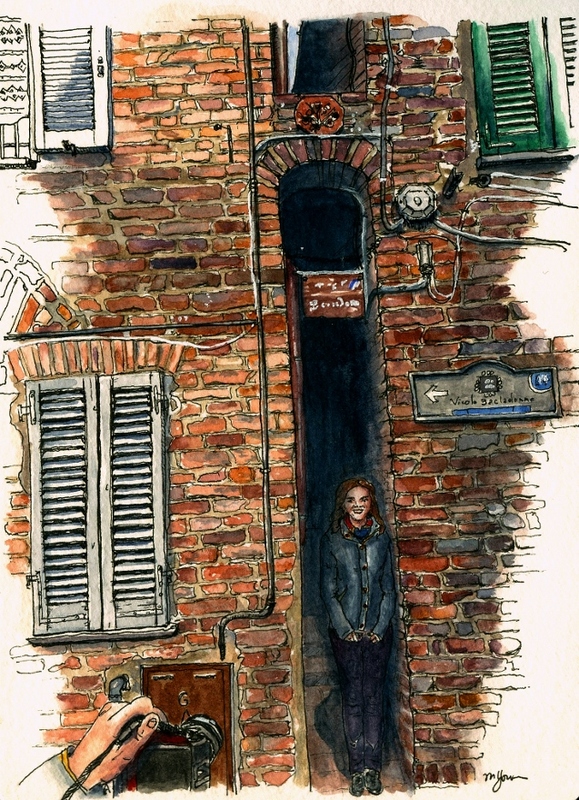 In this piece, also in Citta della Pieve, May poses for cameras in Italy’s narrowest street, Vicolo Baciadonne or the “Kissing Street” (so named because you could lean out the window and easily kiss your neighbour across the street!). Kisses and May go together so naturally! What’s so great about making these types of travel drawings is that the memories keep flooding back, and I couldn’t keep the smile off my face – even as I was painting every single brick in the last drawing! Thanks, Priscilla and May for the memories and the fun art experience! I don’t know how they differentiate alleys from streets. But I marvel at how some things in Italy are so easily turned into tourist attractions.